The head of economic transformation in the ANC has backed finance minister Pravin Gordhan, saying charges relating to setting up an illicit tax surveillance unit are “concocted” and politically motivated. Enoch Godongwana, who leads the ANC’s economics committee, told Johannesburg-based broadcaster eNCA that the investigation into Gordhan is an attempt to remove him from office and weaken the national treasury. This follows the minister’s moves to probe spending at power utility Eskom and South African Airways, and to stop start state arms company Denel joining a venture, that could give business to a company linked to the Gupta family, who are friends with President Jacob Zuma. “I share that view that in fact these charges are being concocted in order to cover all of those things, to find a minister who is pliant, who is going to accept all those things,” Godongwana said in the interview with eNCA. 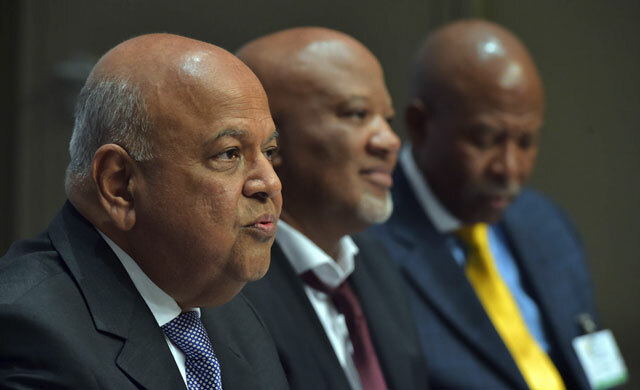 Gordhan may face arrest by the Hawks over allegations he set up the tax investigative body a decade ago when he headed the South African Revenue Service. The minister and Zuma have been at loggerheads over Gordhan’s demand that the tax commissioner be fired for insubordination and that the head of the state airline be replaced. The uncertainty over the charges and Gordhan’s position in cabinet have knocked the rand and government bonds. Perceptions that the presidency and treasury are at “war” are unfounded, Zuma said in parliament on Tuesday. Gordhan has said the tax unit was approved by the government and set up within the law. Well with our gov its becoming ever more difficult to distinguish rhyme from reason.